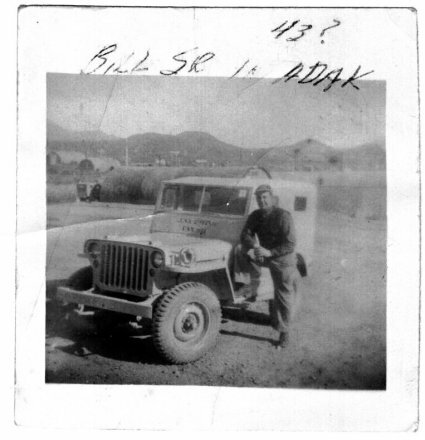 From Claude Darden, “Here is one of my stepfather, in Adak, Alaska, circa 1943. William Carl Lemke (First name was actually Wilhelm after the Kaiser of Germany). He worked for the Navy as a plumber/steam fitter. He was a foreman in this shot! GS-11, I believe. When the Japanese were driven off of Attu, he got on a sea-going tug, along with some other Navy personnel to put the small base back together. He was one of the first civilians to set foot on Attu After the battle. On the trip over, he and and an old Navy chief were on deck, enjoying cigars and sharing a fifth of Seagram’s. The weather was rough and the crew and the rest of the passengers wound up sea sick! About halfway through the trip my stepfather and the chief took over for the seasick crew. He steered while the chief tended the engine! That’s how they completed the trip. He told me that story, every time we went out fishing for salmon, and I would get a little green around the gills! He would tell me “all you need is a good cigar and a shot of whiskey! Fix you right up!” Of course he never got seasick! He was rough but fair, he called a spade a spade and was one of the best mentors I could have had. He may have been my stepfather but I always called him “Dad” with pride and honor! He was on Adak 1942-1943. Worked in the Bremerton Navy Yard in Washington, 1944-1950, repairing the battle damaged ships. He went back to Adak 1950-1953. Married my mother in 1954 and went to the Philippines with us in tow, until 1961. 1961-1966 worked at Bangor, Trident base, Washington. Then back to Adak, 1967-1970, with my mother and younger brother (born in the Philippines). Came back and retired from Civil Service. Died in 1997, age 85. He tried to enlist twice during the war, but the Navy blocked him both times! Seems he was already doing his part!